There is not much history surrounding this vehicle and some would say more myth than fact, but whatever side of the debate you are on there is no denying that a Tiger 1 tank was found in Italy by the Allies. The Bergetiger was the Allied name given to an armoured tracked vehicle found abandoned by the Allies on a roadside in Italy. It had terminal engine failure the main gun had been removed and a boom and winch had taken its place. No other Tiger tanks with a boom and winch assembly in this manner were ever recovered. When found it was assumed that this tiger tank was intended as a heavy recovery vehicle. Germans used the Berge prefix to denote recovery vehicle of tanks, such as the "Bergepanther" and "Berge panzer”. So the allies named the vehicle they had found the "Bergetiger" however no official German name was ever located. Over time many people have disputed the purpose and roll for this one off tank being found. This has been disputed over time and some experts have said that the crane was not designed to tow the weight of the tank and it was not found with any other equipment apart from a towing bar. A popular alternative use or at least theory is that the vehicle was field modified after suffering extensive damage to the main gun. Making it a mine clearing vehicle or to drop explosives to clear battlefield obstacles. Reports on the number of these huge beasts being manufactured varies even though no evidence or German documentation has ever been found to support the numbers in question. You have to admire the way in which new model company Rye Field Models have gone about its first release the D.A.K Early Tiger 1. Then moving onto the full interior Eastern Front Tiger 1 which you have to say was award winning and quite possibly the best Tiger 1 on the market for all the innovations and the price alone. Then came the Gruppe Fehrmann Tiger 1 with some new parts added followed by Bergepanzer Tiger 1 (in between the Gruppe Fehrmann and the Bergepanzer Tiger 1 they also released the Abrams) So for such a new company they are not holding back and have now produced some much needed change to the Tiger fraternity. So what do you get from this latest tiger boxing well first off it is stuffed as full as a Christmas turkey full of plastic, 17 sprues to be precise and again full of detail. In this one you actually get a one piece moulded turret which when you pick it up you have to marvel at the level of small detail like the welding seams the same sprue also contains two halves of a turret too. The one piece hull is again showing some nice welding seams and not too big just right. Looking around the next sprue your eyes will light up at the level of detail you see in such small parts like the casting of the exhaust coverings, the detail to the idle and drive wheels. I really could spend quite some time looking at these parts for some time. The track pins and tracks are not too difficult to master, just fiddly when it comes to the guides on the inside of the tracks. Detail wise I have to say I really like the tracks and being singular act well with sag over the guide wheels. Talking of wheels and as if by magic the next bag of goodies turn out to be the wheels, I like the wheels, to me they look just as they should and easy to go together. I pulled out the next bag to find the top of the turret with various other parts included and I do believe it even has the main gun parts on here, so should you not fancy the berge version you could always make a normal Tiger 1. Next out of the box came the top of the tank which looks too fit nice and snug into the hull of the tank. The level of detail is right up there on these parts. On this sprue you also have the rear plate and some of the exhaust system such as the box air pipes, tools that I really have to give Rye Field Models credit for the delightful detail in those. A smaller sprue is next and it contained some new parts to accommodate the winch assembly and various other tools and some fuel cans. 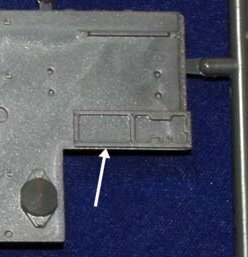 The next sprue I pulled out of the box was the top of the turret for the Berge version new detail on this with areas marked out for the boom. Side skirts and some new parts which go to make part of the mounting for the Machine gun. Another common sprue from all of the Rye Field Models tiger tanks was next and I still have to marvel at the simplicity yet great detail that they have managed to achieve. The last sprue contained all the new parts that go to make up the winch and boom, I have to say that the new parts are very well manufactured and with the same level of detail that anyone who has the Rye Field Models Tigers will know exactly what I mean. The cog wheel for the winch is very well done as is the pulley system boom. There are several pieces of very small parts that will need some care to be used when removing them from the sprue. The Photo etch I have to say from using on my previous Tigers from Rye Field Models are very well detailed and I have to say quite easy to bend without too much risk of breaking one or two new bits I have noticed on the photo etch which I presume would be for the new winch, pulley system. The instructions are easy to follow, but there are some minor discrepancies on some part numbers that had me frantically looking in case I had somehow managed to overlook them. The instructions I have here are only a copy but still look plenty easy enough to follow. Some parts are highlighted when a different piece is too be used giving you some options. The colour profiles are good and give you three different options for different camouflage options. There is a separate page with the marked places for where to put the zimmerit, which a tool for this is included in the box. The decal sheet is very small with four standard German crosses and two different numbers for the tank. It may not be to everyone's taste but I would say this it is a well detailed kit that from past experiences I have to say goes together well with minimal work. Is it accurate? This is the question I am often asked when I speak to people and tell them I have another tiger 1. For me yes it is, I am no expert on tigers but I have seen a lot of different ones and for me this represents a great tank at a decent affordable price. I am sure there will be people cringing out there reading this all I can say to you is give it a try you may be pleasantly surprised by this kit. For me it is a must and having built. Highs: Very good looking kit plenty of details. Lows: The odd discrepancies on the instructions. Verdict: Another well thought out Tiger 1 by Rye Field Models with lots of spare parts and well worth the money. wish they would not call this a Bergepanzer, it was used to set explosives and not recover disabled tracked vehicles. Ditto on that last remark! This was NOT an armored recovery vehicle. I was supposed to get an early release of this...interesting. This is an early pre-release Adam. They want it built for promotional purposes. AGREE! Once again, the mis-identification of a particular vehicle has created controversy ad nauseam... The same kind of clucking over a "Bergetiger" was encountered when CMK and ITALERI did theirs, back in the day... For that matter, RYE FIELD could have done just as well by calling THEIR take on this vehicle an: "Ich weiss es nicht was das isst wagen" mit (???) auf Sd.Kfz.182 Pz.Kpfw.VI Ausf.E (Sf) Trop. Maybe the Germans converted this thing just to confuse everyone!!! The JOKE's on EVERYONE once AGAIN!!! It appears that I was mistaken. The sprues DO contain parts to make a Command version hull, which is what the vehicle had. The instructions don't mention them at all, though.